Pompey Talk is back as the team discuss Saturday’s 1-1 draw at Oxford United. Join Steve Wilson, Neil Allen and Jordan Cross as they pick the bones out of the clash at the Kassam Stadium. 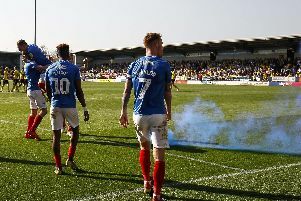 The game’s big moments, Pompey keeping up their unbeaten run and Paul Jones’ return to the team are among the topics discussed. This video is brought to you in partnership with Giant Leap Film & Photography.